Here is a piece of paper that I often give my students the first time that we meet. I often suggest that they play major scales on one string with one finger. In this case, the A string. This way, I joke, they can practice playing music even when the guitar is not in tune. And, I tell them, use one finger at a time. When that fingertip gets sore, switch to another finger. Wow! Two of the biggest problems for this teacher’s soul are solved. The student has a way to practice even if they cannot tune the guitar AND starts to learn a little something about music at the very same time: they start playing by ear, even if they lack confidence in their hands, or their ears. On our first meeting I also often teach my students three new chords. 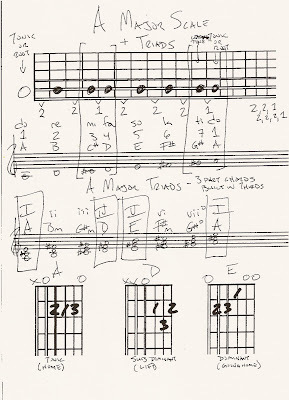 In this case those chords would be A, D, and E. There are diagrams for those chords on the bottom of the page. More on that very soon. For now, go and measure some music. Each of those dots on the fretboard is a musical place. Where can you go? What sounds do you hear? Do, re, mi, fa, sol, la, ti, do? Or if you are from India: Sa, re, ga, ma, pa, da, ni, sa? Very nice place to start! Do you have any tips on visualizing one string scales in different positions? I'm a little confused by your question. The beauty of one string scales is that they are all the same no matter where you are on the neck. Depending on the key, you will have some limitations on what notes are available on that string. But the logic of the scale is made apparent by the linearity of the string. No? Sorry, I did not phrase my question in a proper way. I will try to explain... Guitar players talk about patterns (boxes) a lot. I guess this method does not work on one string, it all boils doing to knowing notes and intervals. What I wanted to ask is if there is any specific method that can be used in learning those. One string playing is the solution to being 'locked' in position playing. Finding major scales and melodies is the best way to learn this. What's interesting about one string playing is that it illuminates the musical patterns in scales and modes. By eliminating the confusion inherent in the guitar's asymmetrical standard tuning, you can perceive musical patterns in a more coherent way. Pretty much from lesson one, though it very much depends on the student.